People have been asking me for lessons so here is one for everyone with an internet connection. Drawing lessons by Honoria Starbuck, Ph.D.
iPad or tablet with drawing app, in this case Paper53. Find this video and set view to full screen. Turn off all the lights in the room. You will only have the light of the screen and the contrast of your selection of pastel colors against the black paper. You are not looking for detail. You are looking to connect to the lines on the cave walls. Sit down and play the video. Let your hand holding the first color of pastel be guided by the lines on the drawings on the cave walls. Follow the contour of one animal. Relax, also be guided by the pace of the music. 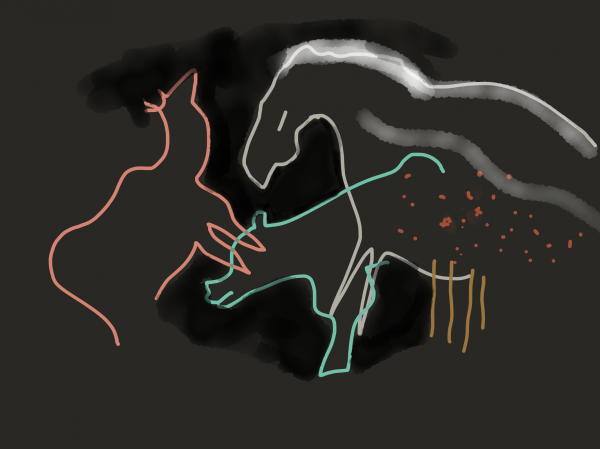 Play the video again and draw another animal with a second color on top of or near your first drawing. Repeat with a third color and a third viewing. How did it feel to draw in the dark? Did you identify with the paleolithic artist? The animals? The darkness? The space and time between you and the original creators? We are all artists and always have been.